The Atherton War Memorial honours the sixty-seven local residents who died in World War One, and on ANZAC Day,1954, a plate was added to pay tribute to the thirty-five local residents who died in the Second World War. 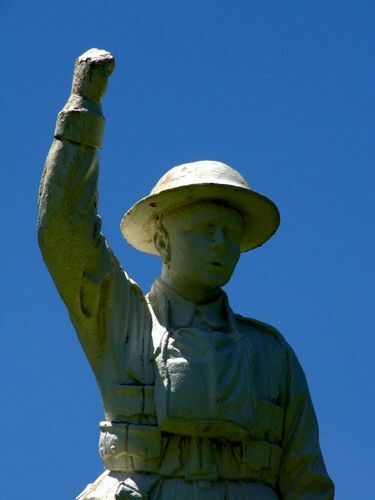 The statue at Atherton is unusual in that it portrays the digger in action, and is the only digger statue in Queensland in an animated pose. It is thought to be designed and executed by Melrose and Fenwick, the leading monumental firm in north Queensland at the time. Funds for the memorial were raised mainly by the local women, with the Atherton RSL contributing £100. The unveiling date on the memorial is inscribed as the 25th April 1924 which is incorrect. It was originally hoped that the Governor would unveil the memorial on this date but he unveiled the Townsville Memorial on Anzac Day of that year. The memorial was unveiled on the 1st May. The impressive ceremony of unveiling the Atherton Memorial took place on the evening of the 1st inst., in the presence of a large assemblage. The Rev. Moline in an appropriate address said that this monument should always remind them of thc inherent unselfishment of man which came to light when the need arose. There was no nobler deed than to lay down one's life for others. They would endeavour to emulate the example of those whose memories they were honouring by unselfishness in everyday life. Mr Grau, Chairman of the Tinaroo Shire Council said that the monument was there not so much to remind those present of the sacrifice of those whose names were on the Tablet. It was there as a lasting reminder to future generations of the deeds of Tablelands men in the Great War. Mr Grau then unveiled the monument, the assemblage standing bareheaded in silence. Cairns Post (Qld), 8 May 1924.